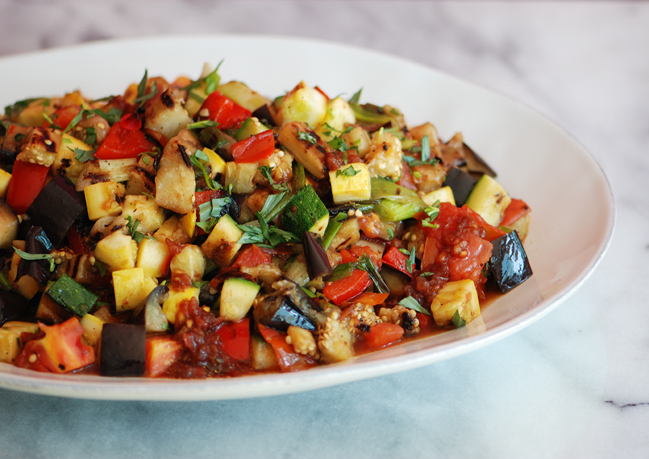 I love ratatouille and have tweaked it over the years to make it my own. My downstairs neighbor always says she hates eggplant and zucchini, but she loves it when I have it in ratatouille…probably because I cook all the vegetables separately and keep them from getting mushy. This recipe is especially good the next day after all the juices have mingled. Note: If the weather is nice, you might want to brush the vegetables with some olive oil and grill them instead of sauteing them on the stove. You can also add other vegetables…for instance, I added artichoke hearts tonight. Spread the cubed eggplant on a paper towel and sprinkle it generously with salt; let sit for 15 minutes. This will help remove any bitterness from the eggplant. In a large pan, add some olive oil and saute the onion and garlic. Remove to a bowl and set aside. In the same pan, saute the red and green bell peppers, adding more olive oil as needed, until they are just starting to get tender. Add to the same bowl and set aside. In the same pan, saute the zucchini and yellow squash, adding more olive oil as needed, until they are just starting to get cooked through…you do not want them to get mushy. Add to the same bowl and set aside. Repeat with the mushrooms. Pat the eggplant with another paper towel and add it to the pan with more olive oil. Saute until it is lightly browned on all sides, but not mushy. Add all the bowl ingredients that have been cooked back into the pan. Add the remaining ingredients and let it cook for a few minutes until tomatoes are soft and releasing juice. Salt & pepper to taste. Remove from heat and allow everything to sit and stew in its own heat for a few minutes, then serve.